WESTBOROUGH, MA- On Tuesday, October 30th, Metamagnetics was invited to the Massachusetts State House on behalf of Representative Carolyn Dykema, to receive the award for “Manufacturer of the Year”. From left to right: Senator Eric Lesser, Mary Beth Westenfield, Meghann Fasolino, Lee Burns, Timothy Tiernan, Representative Carolyn Dykema, Senator Jamie Eldridge, and Representative Jeffrey Roy. 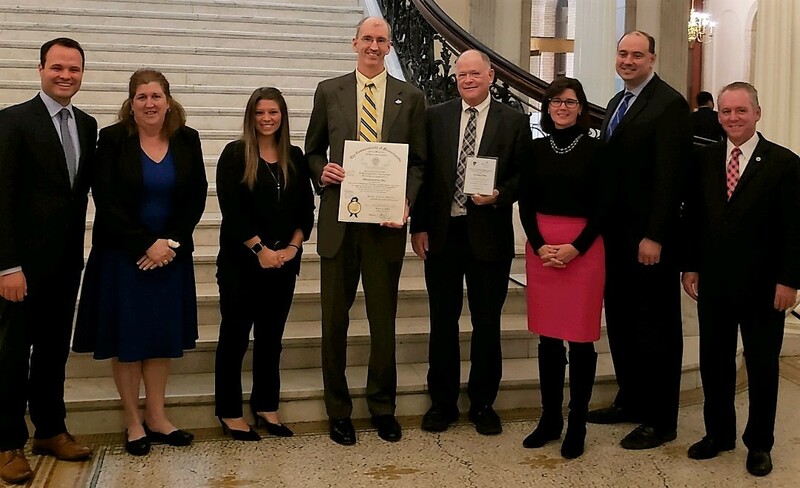 Hosted by the MA Legislative Manufacturing Caucus, the 3rd Annual Manufacturing Awards Ceremony took place on Tuesday, October 30th at the Massachusetts State House in Boston, MA. A small team from Metamagnetics was in attendance to accept the award on behalf of the company. Formed in August 2014, the Manufacturing Caucus includes more than 60 legislators from around the state. Lawmakers focus on training for manufacturing employees; encouraging innovation by helping start-ups access resources; and expanding education and apprenticeship opportunities in key manufacturing sectors. The goal of the caucus is to increase Massachusetts’ competitiveness in manufacturing by providing legislative support. The caucus is focused on expanding opportunities in vocational high schools and community colleges to combat the skills gap. Keynote speakers included House Speaker Robert DeLeo, Senate President Karen Spilka and Secretary of Housing and Economic Development Jay Ash. Metamagnetics was among 59 recipients of the Manufacturing of the Year awards. The Manufacturing Award categories consisted of Workforce and Jobs, Education, Sustainability, Products, and, Innovation. Of these 5 categories, the depth of the talent included companies who make furniture, jewelry, handcrafted electric bicycles, marble and granite, custom paper, flutes and piccolos, precision machined parts for aerospace, and even hummus, craft beer and peanut butter. Established in 2009, Metamagnetics’ 9,200 sq ft. headquarter facility located in Westborough, MA, recently expanded their manufacturing space by an additional 1,800 sq ft. Celebrating their 10 Year Anniversary Metamagnetics develops and markets Radio Frequency and microwave-critical security, surveillance, and, communication systems.